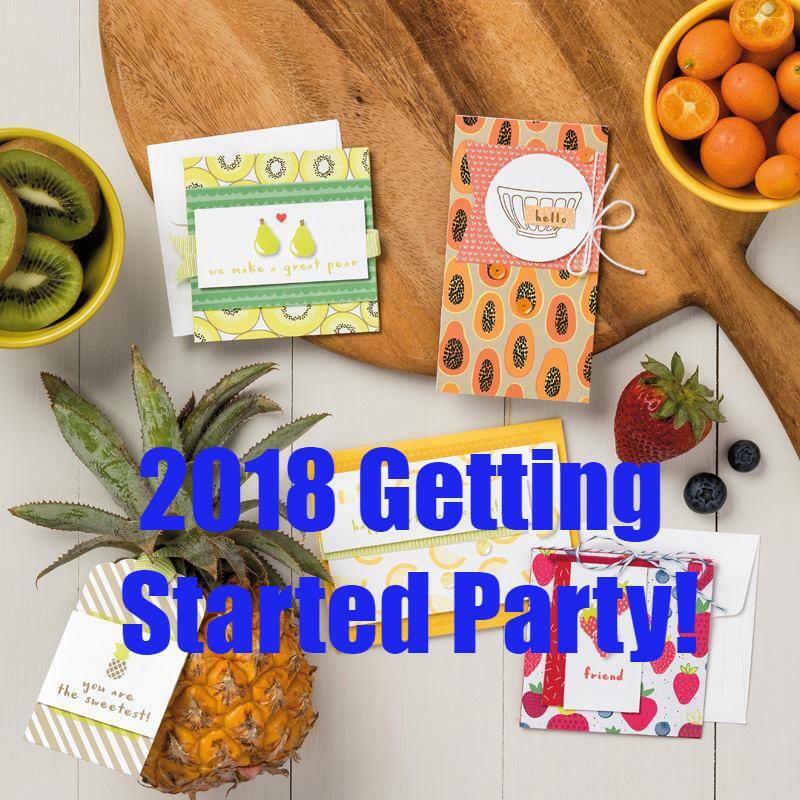 Hello CraftyDreamers, I’m so excited about our upcoming Getting Started Party. This is a great day when you get to be able to purchase the supplies so that you have all the basics and then some to start creating beautiful items. This is one of my classes that is Online as well as In Person! Let me share with you all of the great stuff everyone will get for signing up for this next class. This Class is on March 3rd from 2:00pm – 3:30pm. I’m looking forward to seeing everyone. Online class is at your leisure, I will send a link via email once your supplies have arrived and you will not miss out on any of the goodies! Goody bag of extras to take home to try! Remember I need to know your choices of colors, papers and stamps by Friday as well as payment so I can order everything to have shipped out. My Online class will be a little different as you will also get a direct link to watch how to make your projects as well. Hi everyone, as most of you are aware I was down with a yuck flu for the past week! But yesterday I forced myself up and took a long hot shower so that I could make myself feel better. It definitely worked. I missed chatting with everyone, but I sure appreciate the messages and prayers that I received they absolutely were a blessing! Yesterday I decided to work on my favorite bundle and that is the Petal Palette with the Petal Passion Designer Paper. Omigosh I love all of the black and white, it’s classic, however add that pop of color and it’s so much more. 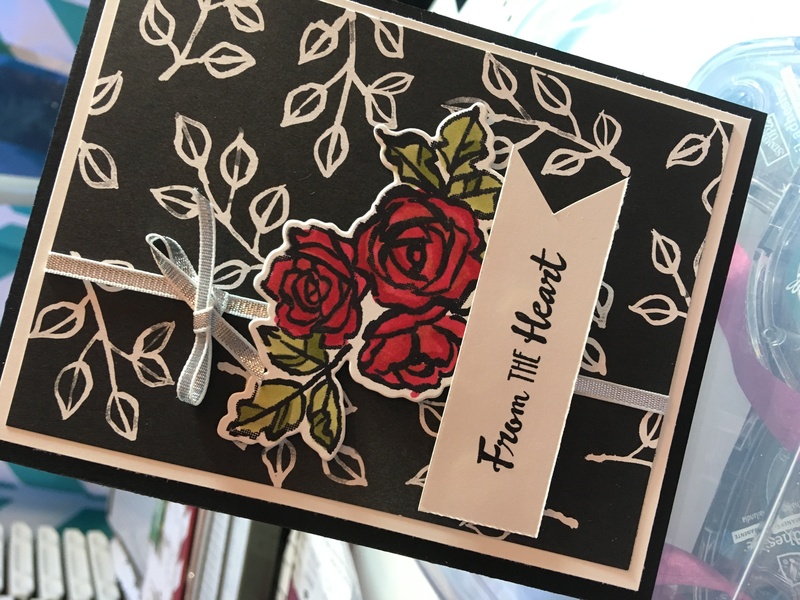 I even played with my Stampin’ Up Blends! If you have not got those, it’s a must. You can start small and purchase 1 set at a time or buy the whole kit at once. I promise you will not regret it! I did a video that really takes much longer than what the card actually takes, but gives you a couple of ideas to try! I hope you enjoyed the video and I know you can tell I’m still got a cold going on but definitely getting better! The New Hostess Code this month is B4W3TGD6. Don’t Forget for every $50 spent you get to pick a free item from Sale-A-Bration Catalog! Also if you spend $150 please let me know so I can give you a personal code for more free goodies! Woo Hoo, my favorite time of the year at Stampin’ Up! The Occasions Catalog came out today, and it is simply awesome. Each year we have a great catalog for the spring and you will love it. One of the great parts is the fact that for every $50 you spend you get to pick a free item from the Sale-A-Bration catalog. How great is that and the catalog helps you to match up with items that you have ordered. Each day I want to share some great items, I’m not going to lie I have some hands down favorites in both of the catalogs. I can’t wait to share each suite of products for easy and fun to create projects. If you would like me to send you both of the catalogs just send me a message with your address and I will get one out to you right away. If you would like get in on it right away here is a link for ordering with the Occasions Catalog. Click Here!! Take a look at some of the products coming your way! Let’s start celebration off right! 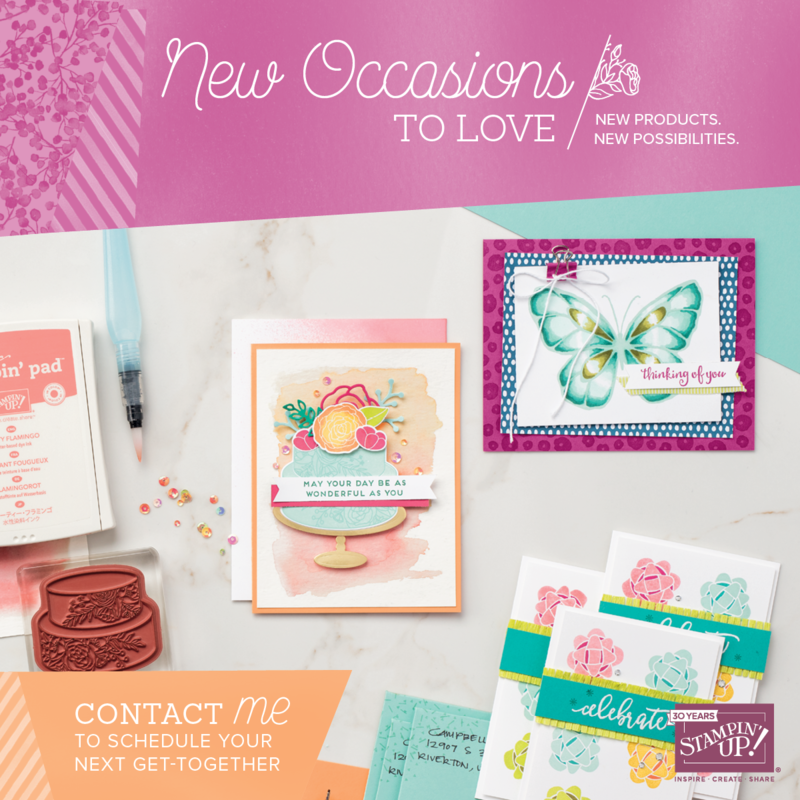 If you would like to get a handmade card made to give to a friend post a comment, if you would like to get a second one guess what my favorite item might be in the new Occasions Catalog. There might even be a hint somewhere on this page!